Polymerase chain reaction (PCR) is a ubiquitous and simple technique used in molecular biology to amplify DNA segments into millions of copies. PCR is a significant method not only for basic research, but also in forensics, medical applications and diagnostics. Quantitative real-time PCR is a modified version that, rather than monitoring DNA amplification after the process is complete, cumulatively measures DNA amplification using fluorescence labeling. Therefore, sensitive quantification of the number of the initial DNA template is possible with real-time PCR. But, bias can occur as a result of pipetting inaccuracies, sequence errors, or unequal binding of fluorescent probes (hybridization). A novel way to measure real-time DNA amplification has been developed by team of researchers from Nagoya University. This method is label free and can avoid bias issues related to other procedures. The details and results of the research have been published in the journal Scientific Reports. The existing label-free detection methods depend on surface immobilization of the target molecules. This process is laborious, expensive, and ineffective over time. Due to complementary probe binding the new method incorporates an element of hybridization bias. The changes in the intensity of diffracted light from a laser beam that passes through miniscule nanochannels, 200 nm (0.0002 mm) in width, containing analytical sample liquids are detected by the new method. A lens is used to focus the 532 nm laser beam. This beam is then diffracted through a nanochannel and detected by a photodiode. The nanochannels are made using silica substrates. The larger the difference in the silica and refractive indices of the sample liquids, the smaller is the shift in diffracted light intensity, and vice-versa. We used this technique to provide the first label-free detection of human papillomavirus and the bacteria responsible for tuberculosis. The method is highly sensitive, and allows quantification of a wide range of initial DNA concentrations, from 1fM to 1pM (a 1,000-fold range), so is superior to existing fluorescence-based detection systems. "Our system also measures DNA amplification at the relatively low temperature of 34°C and without the need for thermal cycles," coauthor Noritada Kaji says. 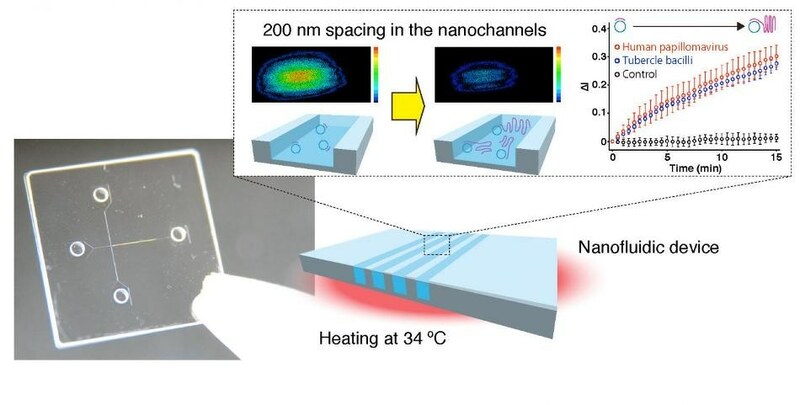 "Because it has the potential to be constructed as a single chip and can detect sample volumes as small as 1μl, which is 100-1,000 times less than conventional detectors are capable of, it is particularly suited to development as a miniaturized form of diagnostics and microbe detection."